The much-awaited compact SUV from Nissan has been officially launched in India at an introductory price of ₹ 9.55 lakh for the base petrol variant. While the Kicks has been on sale in the international markets for quite some time now, Nissan has modified the original design for India. What has changed on the India-spec Kicks is the front bumper, which has been redesigned with air inlets above the fog lamps and a faux aluminium skid plate, all of which give the SUV an off-road appeal. The other difference comes in the form of LED headlights, coupled with boomerang-shaped LED DRLs and a new, honeycomb mesh grille with a V-motion design. The model here also features a floating-roof design, courtesy of blacked-out pillars. Further, the Kicks has been made larger for the Indian market and it shares the same M0 platform which underpins the Renault Duster and the Captur. In order to make the Kicks a lucrative option for buyers in its segment, Nissan has given it some first-in-class features like a 360-degree parking camera and a leather-covered dash. However, it does miss out on some crucial features like a sunroof, wireless charging and telescopic adjustment for the steering wheel. For an infotainment system, the Kicks gets an 8.0-inch floating touchscreen system complete with Apple CarPlay and Android Auto connectivity. The screen doubles-up as the interface for the parking camera. Placed in front of the driver is a semi-digital instrument cluster with a two-pod layout with one pod dedicated to the tachometer and the other to the fuel gauge. The speedometer remains digital. 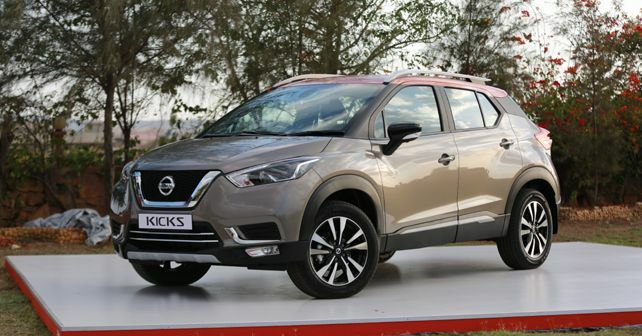 Nissan has introduced the Kicks with the same engine options as those found on the Terrano and the Renault Duster, which means that it gets the 1.5-litre H4K petrol motor and the trusted 1.5-litre K9K diesel engine. The petrol motor, which develops 104bhp and 142Nm torque, gets a 5-speed manual gearbox while the diesel option, which churns out 108bhp and 240Nm of peak torque, comes mated to a 6-speed manual. The absence of an automatic option at the time of the launch is likely to become a bone of contention with prospective buyers. Another chink in its armour will be its relatively low power output, keeping in mind the Creta's 1.6-litre diesel motor puts out 126bhp. At 4,384mm, the India-spec Kicks is 89mm longer than its international iteration and with the width and height figures pegged at 1,813mm and 1,656mm, respectively, the version here is wider and taller as well. To put things into perspective, the Kicks is marginally bigger than the familiar Terrano. The Kicks will be offered in four variants in total - XL, XV, XV Premium and the top-spec XV Premium +. While all four variants get the diesel option, the petrol motor option has been restricted to the XL and XV variants. Since the top-spec XV Premium + variant gets the all the bells and whistles, to make owners happy, Nissan has ensured that even the lower-spec variants remain packed with features. The base XL variant will be offered with features like LED DRLs, a six-way adjustable driver's seat, power windows (front and rear), electric ORVMs, automatic climate control, rear AC vents and Bluetooth connectivity, which makes the entry-level variant a pretty sweet deal. Features like automatic climate control, ABS with EBD and brake assist, dual-airbags and Nissan Connect will be offered as standard across all variants. Nissan is offering the Kicks with a total of 7 colour options- Pearl White, Blade Silver, Bronze Grey, Amber Orange, Deep Blue Pearl, Night Shade and Fire Red, while the top-spec variant also gets an optional dual-tone paint finish. The dual-tone colour combinations available are Fire Red & Onyx Black, Bronze Grey & Amber Orange, Pearl White & Onyx Black and Pearl White & Amber Orange. You can also take a look at how the Nissan Kicks compares against its chief rivals in our spec comparison. To make the ownership experience hassle-free, Nissan is also offering a three-year warranty, three-year and 24/7 roadside assistance and three-year service maintenance free of charge for the first 10,000 customers. Buyers also have an option of upgrading this package to a 5-year tenure for a nominal fee. Here's a variant-wise price breakup of the Nissan Kicks (all prices mentioned below are ex-showroom figures).